The shattered family of a little girl mauled to death by a pit bill on Long Island over the weekendmourned the loss of their ”princess” Monday — as cops weighed whether to bring criminal charges against the dog’s owner. 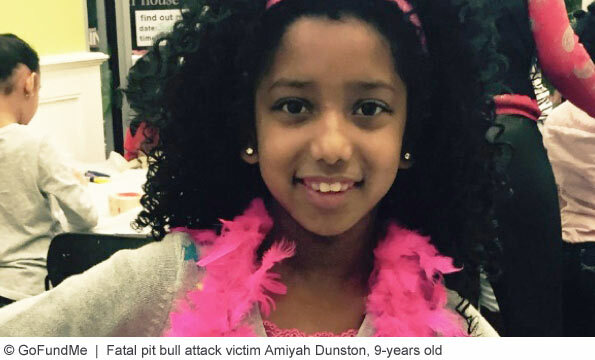 Mayra Castillo, the devastated mom of Amiyah Dunston of Baldwin, clutched her 9-year-old daughter’s denim jacket as she left her home with friends to pick out funeral clothes for the girl, family said. Amiyah was visiting her biological father at 236 Holland Ave. in Elmont when she was brutally attacked by a pit bull name Kane around 10:30 a.m. Sunday, according to Willis. Family and friends posted photos online of Amiyah, some referring to the beautiful little girl as “our princess” and “Curly Sue” for her curly hair. “She was a beautiful, smart and loving girl who touched the lives of all who knew her,” said a post on website Go Fund Me. The pit bull’s owner, 29-year-old Carlyle Arnold — who lives on the second floor of the home where the girl was attacked Sunday — was arrested at the scene on an unrelated charge, according to police. Arnold, a former welder who is currently unemployed, has two other open cases in Nassau County for child endangerment from last year and criminal possession of stolen property from October, according to court records. He was arraigned on the new criminal-contempt charge Monday morning in Nassau County court after allegedly violating an order of protection involving his girlfriend. The Nassau County DA’s Office and police are investigating whether to bring criminal charges against Arnold in the fatal dog attack, sources said. 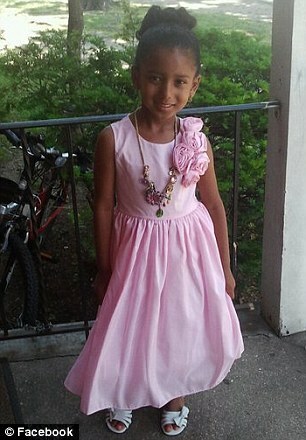 Another innocent child brutally murdered by a pit bull that should never have been in her neighborhood. Pit bulls are not pets. Pit bulls are killing machines. You have a pit bull that hasn't killed? Who cares? Get a regular dog and get the same outcome. This poor child is dead. Her crime? Playing in a yard with other children in the vicinity of a pit bull. She got the death sentence, and the rest of us DON'T GET BSL. Any idiot can own a pit bull. They all think they're cool until their pit bull does something the rest of us expect because DNA, but the nutters just stand there in disbelief saying, "He's never shown signs of aggression before." Why do they always look for that excuse? What triggered the pit bull? The child must have done something to cause the pit bull TO FATALLY ATTACK! As if there is ANY REASON that makes a FATAL ATTACK by a pit bull OKAY! This is the level of insanity that we have reached. Whatever the reason, it is NOT ACCEPTABLE for a PIT BULL to kill ANYTHING!